Tower Mill - brick built with sails. 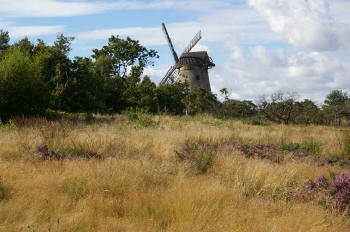 The current Bidston Windmill was built on Bidston Hill on the Wirral Peninsula, Merseyside, in about 1800 and continued working as a flour mill until 1875. It is believed that there has been a windmill on this site since 1596. This brick built tower mill replaced a wooden 'peg' mill that was destroyed by fire in 1793. 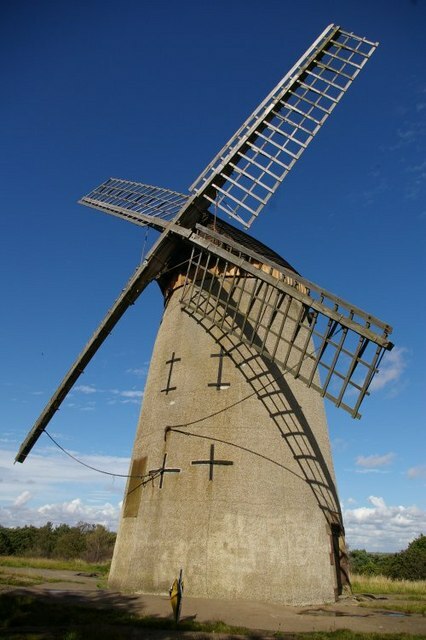 The mill is ideally placed to catch the wind, but difficult to access by cart. In this style of windmill the top or 'cap' could be turned so that the sails would face the wind, from whichever direction it was blowing. You can still see the large wooden chain-wheel which was used to slowly turn the roof around by a rack and gear system. Tam O'Shanter Cottage & Bidston Observatory are also on Bidston Hill.